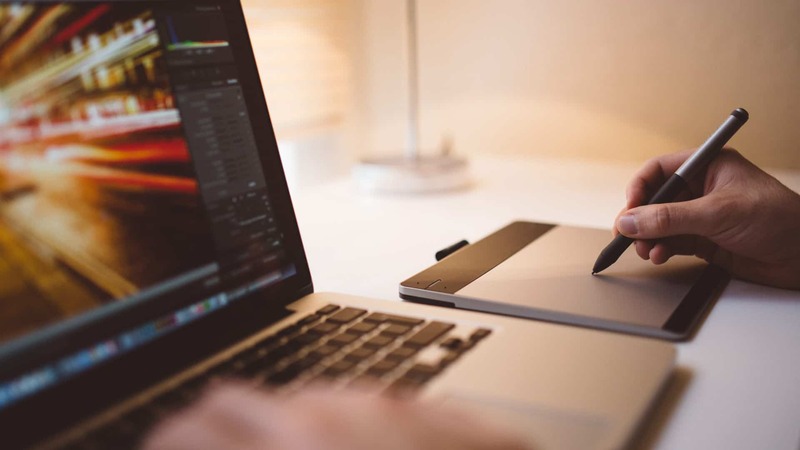 Create a strong personal brand across all your social platforms with this no-nonsense guide. When people visit your social profile, are they impressed? Does your social media presence look like one cohesive, professional brand? If you cannot confidently shout “yes” to both of the previous questions, we’re going to fix that. Want the PDF version of this post? Just go straight to the download box and enter your email address for instant access. Having a solid, attractive and professional social media presence can open up countless opportunities. Business, partnerships, employment opportunities and much more. Heck, I’ve gotten six different job offers over the last two years just because of my social media presence. And I haven’t even been looking for a job since 2012. It all starts with having a solid personal brand. 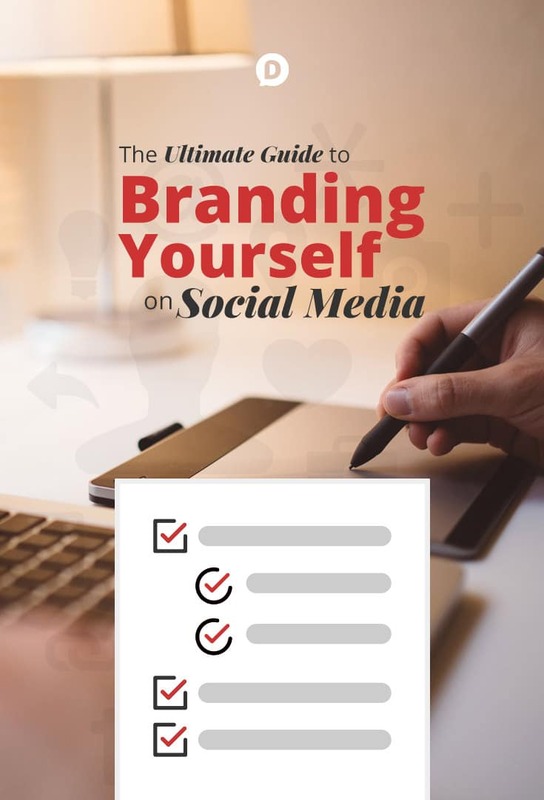 The goal here is to make sure your personal brand, across all your social media accounts, is one you can be proud of and will give people the best possible impression. 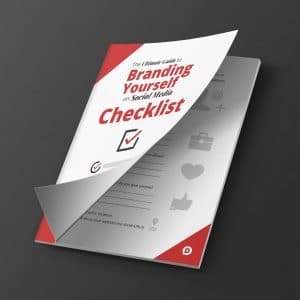 Download the free quick-reference checklist and worksheet for Branding Yourself on Social Media for easy access to all the tips included in this article. The first thing you need to consider is your name. This might sound like a “no, duh” moment, but it is something you need to be aware of. Ultimately you want to have the same name across all of your social channels. Sometimes this is not possible, and that’s not the end of the world. But if you can make this happen, it is the best route because it makes it super easy for people to find you. Now, the only exception here was that I didn’t get to use the “w” in my Google+ profile URL because when I received the custom URL, it was automatically given without the ability to customize it. Because I was one of the first people to get a custom Google+ URL a year before everyone else did, I didn’t argue. I highly recommend you avoid using pseudonyms or ambiguous numbers. Cheeky or clever usernames with your birth year at the end were fun in middle school—we’re trying to build a personal brand, though. So stick to your legal name or some version of it. If you’ve already started a social media profile with a pseudonym, consider starting a new account if you cannot change it. Trust me; it will be worth it in the end. Next, we want to make sure Arnold doesn’t have to interrogate your kids just to find out what you do. Make it clear and easy for him to check your social profile and have all the info he needs. This is not an easy task when you have limited space in which to do it. You will want to make the most of it by keeping it simple and effective. Just be sure you give those three items above covered in the allotted space you have. If someone is taking the time to read your bio, make sure they’re not left scratching their head afterward. Now, many of you reading this are not SEO people. And that’s fine—neither am I. I leave that to smart people like Mark Traphagen. 3. What value do you give to people? What value do you want to give to people? See, that’s not so hard, is it? Now, by going through that exercise you should have identified a few strong keywords that need to be mentioned in your bio. Most social media profiles give you the ability to show where it is you’re located. This might seem scary to some, but you don’t need to give your home address publicly. Having a general geographic location can help you significantly in getting local opportunities and recognition. Studies have even shown that having well maintained social profiles linked to a local area can boost local search rankings. So make sure you don’t skip representing your neck of the woods. This tiny bit of geographic contextualization can help people relate to you more and make you seem like more of a real person. Because let’s be honest, it’s hard to think of people online as real people. That’s why it’s so much easier to get bent out of shape and berate someone via Twitter than it is when they’re your next door neighbor. You’ve heard what the biggest social media mistake is, right? So you already have a home base (website) where you’re sending people to? Okay, good. Now don’t forget to make sure this is visible in your social media profiles! Let’s break down why each one of these is a big no-no. Just do it. 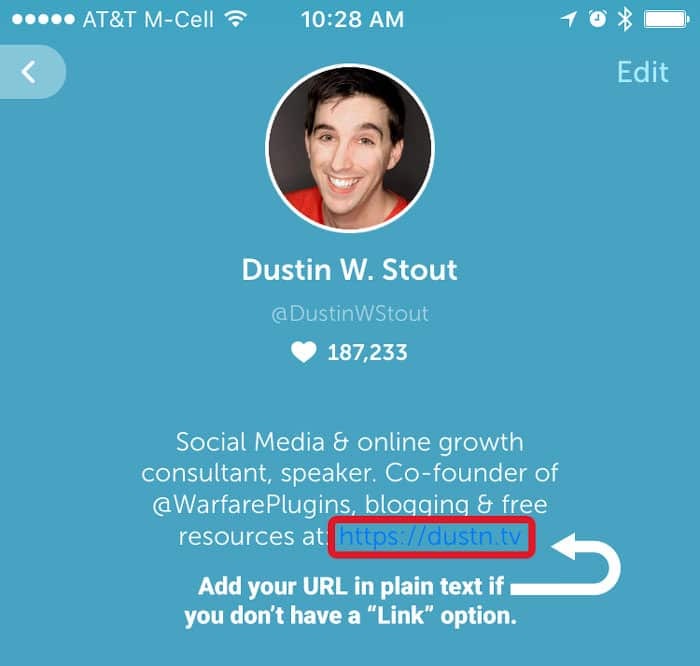 If the social network doesn’t provide you with a place to add a URL, add it right into your bio. On Periscope, for example, they don’t give you a place to link somewhere else, so I’ve just added at the end of my bio. You have to assume that if you’re doing a good job maintaining a significant social presence that people are going to want to know more about you. Don’t miss those opportunities. Link your website. If you don’t have a website (did I mention that’s the biggest social media mistake?) and all you have is a primary social network that you want people to connect with you on… well, fine. I guess that’s all you can do. But get a freaking website. If you do have a website and you’re still linking to another social network profile, stop it. When someone discovers you on a social platform, it’s highly likely that it’s their platform of choice. Don’t give them the impression you’re not as invested in their platform of choice by promoting another. Don’t get me wrong, I love me some short URLs. However, if you’re using a generic URL shortener for your primary URL for people to see when they first meet you, they’re not going to click it. It’s too easy for spammers, hackers, and untrustworthy people to shorten a URL through a generic shortener like Bitly or Goo.gl. Too many unsuspecting people have clicked through to somewhere they never wanted to go on these types of links and been burned by it to make it your first impression point. Just use the full URL you want them to visit. Period. If someone doesn’t already know, like, and trust you, they’re not clicking on a generic short URL. The only exception to this is if you’re using a custom branded short URL and it’s clearly a shortened link that you own. I’ve covered how easy this is to do in my previously mentioned post about short URLS. Your profile picture is a crucial part of building trust. So take some time and get a good shot of yourself to use for your profile picture. It doesn’t need to be a professionally done photograph—you don’t need to book a time to do glamor shots with the local Senior Class Photographer. That’s it. That’s all you need for a solid social media profile picture. To have a good quality profile picture across all your social media profiles, it needs to be a minimum of 500×500. Now, none of the social networks will display it that big, but you can upload it at that size, and they’ll worry about resizing it. You don’t have to memorize the exact profile picture size of every different social network. One good 500×500 that you use across all your social platforms is all you need. Yes, I highly encourage you to have the same profile picture across all your social channels. Why? Because you want people to recognize you instantly. You don’t want someone who follows you on Twitter look you up on Pinterest and sit there for three minutes wondering if they found the right person. 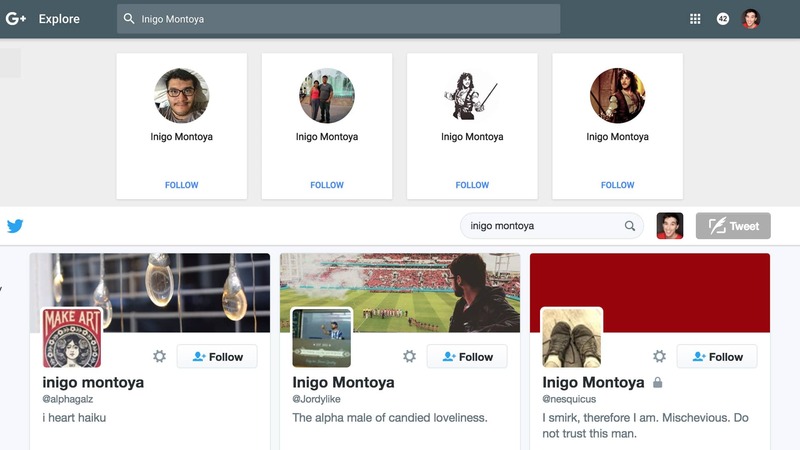 How am I supposed to know who the real Inigo Montoya is? Recognizability and good branding go hand-in-hand. Now I’ve already dedicated an entire blog post to social media cover photos which also includes free downloadable templates. Grab those. They’re always updated with the latest dimensions and recommendations. One more thing I’ll emphasize here on the topic though is that you should make it less about advertising and more about showcasing your personality. Think of it as a visual expression of your bio. Have your social media cover photo represent who you are, what you do, or what you’re passionate about in the form of a photo or graphic. And use as few (if any at all) words as you can. When most people hear the phrase “branding yourself on social media”, they may instantly think of visuals, colors, logos and typical things associated with a brand identity. Branding is not just about looks. 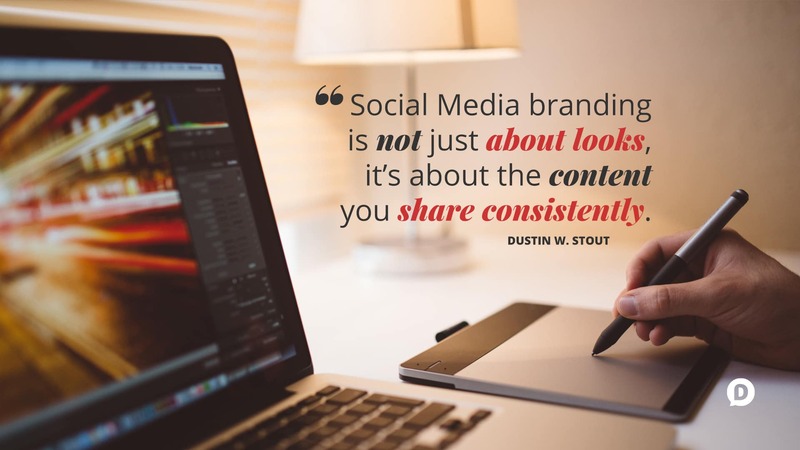 Branding yourself on social media also relates to the type of content you’re sharing. When someone discovers your profile and begins scrolling through your social posts, are they seeing content that falls in line with the rest of your profile? Or in other words, if you say in your bio that you’re a pet lover, are there posts in your stream that prove it? When you went through and found your keywords for your profile, you should also be using this as a guide to the types of things you’re sharing on your social channels. Sharing things on social media that are consistent with what you want your brand to be known for is the most crucial part, and one people often miss. Be strategic in what you share so as to be consistent with the brand you’re creating. Some might argue that this is the most crucial part of the process. If you can’t do this consistently, hire someone who can. As long as you are consistent with all the above, you will develop a brand worth following on social media. You will solidify your reputation and people will know, like, and trust you as the authority in your fields. Time is your friend, but only if you are consistent. Building a solid, trustworthy personal brand doesn’t happen overnight, but it does pay off in many ways. Are you building a strong brand on Social Media? What network is your focus? Let me know in the comments below. Hey Dustin, thanks for the simple questionnaire! it makes identifying keywords so much simpler! Adorei o Conteudo vou atentar sempre nessas dicas apartir de agora. Obrigada. This is exactly what our team was looking for! Thanks for creating such a practical resource. I loved your content, I did subscribe on newsletter to get more info about it.